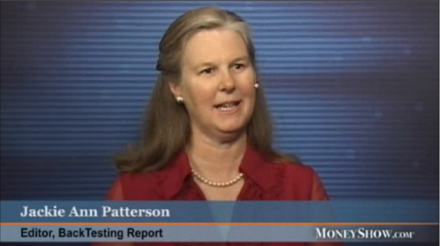 Back-testing expert Jackie Ann Patterson shares her extensive research on simple ETF Rotation techniques in a live workshop on August 15, 2013 at 5:10pm pacific time. WOODSIDE, Calif. - Aug. 12, 2013 - PRLog -- BackTesting Report, an educational resource for investors and traders, today announced that editor Jackie Ann Patterson will be featured in a live workshop at the MoneyShow San Francisco on August 15, 2013 at the Marriott Marquis San Francisco. The purpose of the session is to help individuals learn how to apply the ETF Rotation style of portfolio management. This session reveals the ups and downs of investing in exchange traded funds (ETFs) using a simple strategy to select among top funds. The first half presents an overview of the winning strategy from those back-tested in the popular book, Truth About ETF Rotation. Following that will be a discussion of lessons learned in the first year of live account management using the strategy. Everyone is welcome to attend at no charge. About MoneyShow: Guided by the belief that "knowledge is power" and recognizing the desire of independent minds to rely on self rather than institution, MoneyShow has been empowering individuals with a passion for investing for three decades. The company pioneered the investment tradeshow field in the early 80s, creating the concept of a "MoneyShow" and developing a business model which gathers qualified investors, traders, and financial advisors together with top financial experts, business, and media professionals, offering all participants unparalleled opportunities for profitable interactivity, idea exchange, relationship-building, and learning. From regional beginnings, MoneyShow has evolved into a global, financial media company known as the world's leading producer of investment and trading tradeshows, as well as producer of the award-winning, multimedia online community, MoneyShow.com, and the interactive eShows. With a purity of purpose that has never wavered, the company continues to enable individual investors, traders, and financial advisors to obtain focused advice directly from the top minds in the industry and make their own decisions, thus fulfilling a fundamental need and inspiring trust and loyalty throughout the global marketplace.